It’s funny the way that life works out sometimes. Lately, I’ve found myself reading and hearing a lot of sad stories on facebook and in the news. The December school shooting in the US, the death of a little girl in Toronto at the hands of her mom, a friend of a friend who’s daughter passed away from a rare form of cancer late last year and a story about a girl who died because of an accident where her furniture wasn’t attached properly. The last one sent me on a mad dash around my house last night with my drill, my stud finder and a bag of deck screws. Let’s just say we can never ever more or rearrange anything in our house until my kids are teenagers. But the point is I seem to keep finding sad stories about losing children. I don’t know if I subconsciously search these out or if because I have a large circle of friends and listen to the CBC radio at work all day I just hear all the things going on both good and bad, and let’s be honest, as a mom the horrible stories tend to stick with you. But because my family has felt the loss of a child through my sister, I find these stories really hit home with me and they not only upset me to the point of feeling for the pain the parents face, but I’ve seen what it does to a parent and it rips my heart out. I actually start to become physically ill because of how hard I take some of these things. It’s gotten to the point now where several people who love me very much have made it clear I am NOT to read anymore of these stories. I told them I would and I will try my hardest not to, but sometimes I don’t realize what it is until it’s too late. But sometimes life works in funny ways. A few of these stories found me in the past 48 hours and at bed time last night (which was a crazy early 9:30pm) I was crying because I picked up my ipad and the article was open on it, and I just burst into tears again. I know the pain of losing a sibling that the girls’ brothers are going through, the loss of the marriage of the parents, the hurt everyday. I wanted to help them heal but it’s a pain that can not heal, though the way my mother holds and interacts with her granddaughers is something magical. They bring out a side of her that I never knew, that I never remember seeing, and that brings me hope that they have a magical ability to help heal a pain that she’s had for over 20 years. So I went to sleep and Steve held me and my mind raced of pain and loss and sorrow of losing a loved one. At 1:50am the phone rang. A call at this time of night is not usually good news. I dragged myself to the phone across the room and was very confused to hear “It’s Sam*. Deb* is in labour, and our friend to watch Hannah* [their toddler] isn’t answering. Can you come over?” I took a second to figure out who this crazy guy calling me at 2am was and if he had used his first name Steve, I would have probably have handed the phone to my husband, but my friend and coworker was due on the 1st so my brain luckily caught up quick. I asked how far along she was since I take like 24 hours to have a kid and he told me 1.5 hours in and their first took 4. I said “I’ll be right there.”, hung up and threw on a nicer shirt, jumped in my husband’s car and drove the 3 minutes down the road to their house. Sam* had told me I could just come in since the door was open for the midwives already, and I walked right in, told the midwife to let them know I was there, and headed for Hannah*’s room. Her dad thanked me for coming, gave me an update, told me what books to read to Hannah* and headed back to my friend. I played with their daughter, read to her, cuddled her, and just kept her happy and distracted. At 2:37am I heard some commotion and a loud scream and soon after my little friend was brought in to meet her baby brother. Then I watched her some more so that her mom could get cleaned up and everyone checked out. At 3:30am I got to see the little man and he was perfect, and beautiful, and I feel so honoured that they trusted me to be there with them. They had a home birth and it was mom, dad, big sister, midwives, and me who were in the house when he entered the world. I got to meet him before any of their family, and I feel so touched that I could be there to help them out when they needed it. I got to stand it awe and see this perfect little family created right before my eyes, as the baby was being wrapped and big sister was watching, and mom was holding her. It was a real miracle. I left around 3:50am when the baby had been checked, and I knew my friend was alright to let the family have a bit of alone time with their new baby. I know when Katrina was born I wanted Steve and Lillian around me so bad, and just take in the whole thing. But having been part of their special night really touched me. I feel as if all the sad I’ve read lately, is part of this cycle. Yes death is hard, but without it life would have no meaning, and to have been on the other side of a wall, when a baby entered the world (and it wasn’t me pushing) is amazing. So thank you to my friends for asking me to help out. I know I was just a backup but you sharing this amazing night with me has changed me forever and is a night I will never forget. 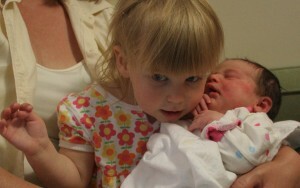 I didn’t feel right posting her photo, so here is one of Lillian on the day Katrina was born. There is someone so special about a big sister meeting her new baby.